Cut the bacon into 1cm pieces. Warm a large frying pan over a high heat. Add the bacon and fry for 2-3 minutes or until golden. Cut the bread into cubes the same size as the bacon. Pour two-thirds of the dressing into the pan and heat through until very hot and bubbling. Add the bread and stir until it absorbs the hot dressing. Fry for a further 2-3 minutes, stirring occasionally, until golden and crisp. 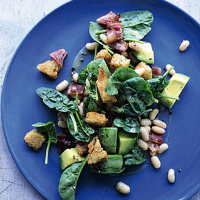 Place the spinach in a large salad bowl or onto a platter. Remove the stone from the avocado and peel. Cut into chunky pieces and add to the salad bowl. Drizzle over the remaining dressing and toss together with some freshly ground black pepper. Add the cannellini beans to the hot pan and mix in gently. Scatter the contents of the frying pan over the salad. Serve immediately with extra crusty bread on the side.